It’s a move which club bosses are hoping will appeal more to families who couldn’t bring their children to Thursday night racing during school term time. Co-promoter Damien Bates admitted they had to think long and hard about the start time which he feels will allow time for travelling fans to get home at a sensible time. “We can make more of the occasion on a Sunday,” said Bates. “We want to encourage families to come and enjoy a great day out and we are looking at things like rider signing sessions and Q&A with the management and team members after a meeting. “Its a big move to switch away from Thursday to Sunday but we believe we can make it work. “I think there will always be some people who are unhappy about it but we’ve had social media feedback from parents saying they are now bringing their kids to the speedway because of the start time. “We are looking at doing rider interviews during the meetings to keep the fans informed about what’s happening in the pits and we have lots of other ideas. 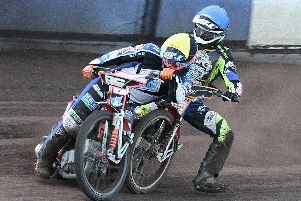 Sheffield will unveil two more riders this Wednesday in the Panorama Room at Owlerton. Both riders are expected to be present along with boss Simon Stead and new signing Drew Kemp. The event starts at 7.30 and entry is £2 on the door.